Battling Perfectionism: The Aftermath | Marie Loughin's "I WANNA BE . . ."
Is Perfectionism the Black Knight? Or am I? Who is King Arthur? 1) Not a single one of us accomplished our respective word count goal. 2) The event was a resounding success. Word count is a lousy way to measure progress. It tells you nothing about quality. It tells you less than you think about progress toward “The End.” Some people open their novels with a “walk to the plot” and will end up chopping the first ten pages of their rough draft. Others rush through the first draft, leaving notes and reminders in their wake, planning to fill in research, backstory, and descriptions during a more leisurely revision. Such people may cover the first third of their story arch in the first ten pages. Case in point–Jonathan actually had two goals: 50,000 words and finish rough draft of new novel. Let me tell you something about Jonathan–his brain does not work like other people’s. I suspect his writing speed is limited only by his typing skills. He churned out roughly 45,000 words in four days. That’s nearly 200 pages, folks. Fifty pages a day. I don’t…I just…there are no words. Though this fell short of his 50,000-word goal (slacker), he did finish the draft of his novel, Imogene. I suggested that Jonathan type a bunch of random words at the end so he could meet both goals. Aniko achieved something over 12,000 words. That’s over 48 pages. Though she fell a little short of her 15,000-word goal, she gave her next novel a great jumpstart. That was her real goal. And then there’s me. The one with the perfectionism problem. I set my word count goal ridiculously high (for me) at 25,000 words, or 100 pages. The idea was to force myself to write without looking back. The outcome was mixed, but I learned a lot. Here is a day-by-day accounting. Did I defeat my perfectionism? Not completely. You can tell because my total word count (10,521, 42 pages) does not equal the sum of the daily word count. But I did discover some tools that will help me in the future. Which is good, because it turns out that fighting perfectionism is not just a one-shot battle. It is a war. *Special thanks go to our Twitter supporters, especially Char Newcomb, who joined #laboringaway for a couple of days, achieving personal best word counts. Way to go Char! This entry was posted in Marie's Fiction, Writing and tagged Aniko Carmean, Char Newcomb, Goal, Hannah Loughin, Jonathan D. Allen, Perfectionism, Word count, Writing habits. Bookmark the permalink. FAntastic! That’s all I can say! 50K? Wowee! I’m more like you. Family comes first. How’s your daughter’s ankle? Ankle is sprained, not broken. She’ll be hobbling for a while, but she’s in good spirits. That’s a relief. Although sometimes a fracture heals better than a bad sprain. Terrific counts all the way around. Congratulations to all. Wow, I had a super long comment about the value of word count, but I got an error when I tried to submit it. Even thought about copying it before hitting submit, which I’ve found is usually a good idea. Oh well, maybe we’ve already talked about it. The general gist was that I use word count for two reasons. The first is to see when I’m in the “acceptable novel word count” range. The second is to track my progress as a writer. I use a daily tracker for my writing. I learned this from someone who said it helped her realize what times of day she is most productive. 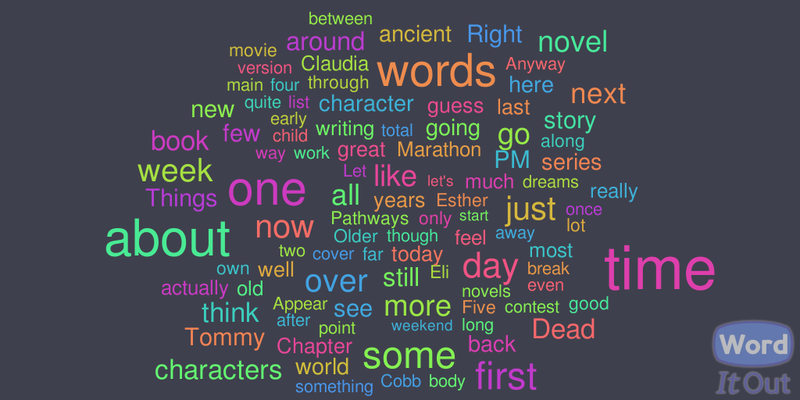 As a father of two kids, I don’t really get to choose when I write, but I have noticed that the more I consistently write, the higher my average hourly word count is. Granted, I have days when I’m writing a scene that really flows and my fingers are flying and I exceed that count, and days when the opposite is true (which makes me doubt the scene, of course. There’s that perfectionism), but overall, I’ve noticed a significant rise in output when I am consistently practicing the craft. Anyway, glad to hear it was a good experience for you (and cool about Hannah. Didn’t know she was a writer as well). Keep going! Yes, clearly word count has it’s uses, as long as it’s not the focus. A 200 word day can still be a good one if the passage is particularly difficult or important. Congrats to all of you, that’s just fantastic! Those were some tough goals to face and I’m really impressed with the sheer volume of what you produced.